"Written on four continents and read on six, the works in this anthology celebrate the birth of a new literary form: the tweet. Ironically, the 140-character limit of the Twitter platform has inspired new and veteran writers alike to stretch traditional boundaries. Some experiment with abbreviated poetic forms. Others create back-story through innuendo. All make every word—every character—count. 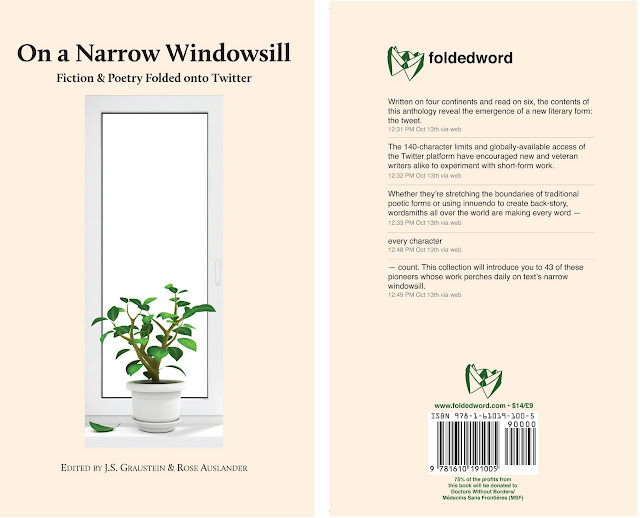 This collection introduces 43 of these pioneers who venture out each day onto text’s narrow windowsill. 75% of the profits from this book will be donated to Doctors Without Borders/Médecins Sans Frontières (MSF)." Read the full press release HERE. Now available for pre-order HERE.